As it warms up in my area, I am already starting to notice fruit flies in the kitchen. I certainly don’t miss having hem around in cooler winter months! They aren’t out in full force yet, but I know it won’t be long. I understand the temptation for them with all the fermenting experiments on the count, so it isn’t like I a surprised they are around, but it just gets hard when you do to take a drink of something like ginger beer and find a fruit fly floating in the glass AGAIN! Last summer I tried a few experiments to try to control their numbers. This is the one that I found that worked best. I took a smaller sized mason jar and put some ginger beer in it (you can use anything sweet and tempting to a fruit fly – even cut up fruit.) Then I covered the jar with a piece of paper and secured it to the jar with a rubber band making sure that it was tight around the jar (no gaps at all). 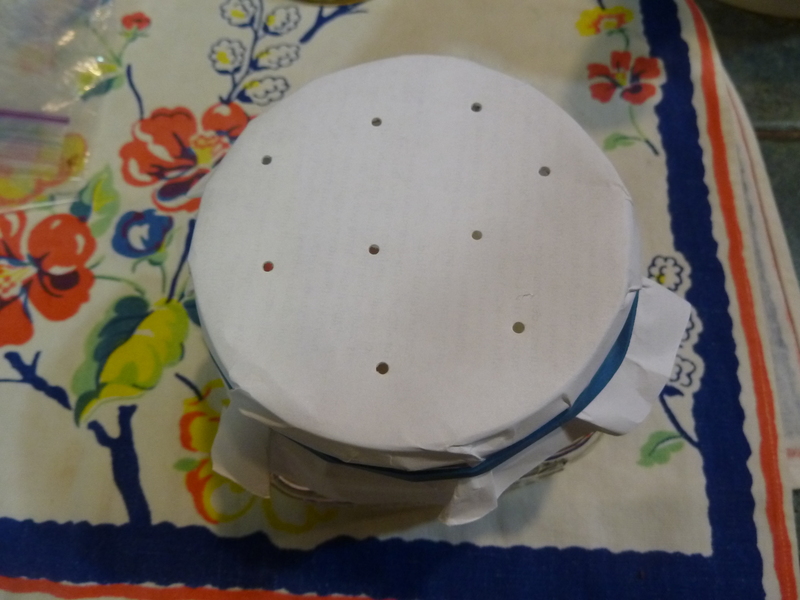 Next, I poked holes in the top with a larger needle. The holes needed to be big enough for the fruit flies to get in, but not get out. I tried this with plastic wrap at first but if I poked a hole to big that was non productive and I also noticed that after a few fruit flies were trapped in there, that was it, no others seemed to try. That is why I switched to paper, thinking the fruit flies on the outside couldn’t see the ones on the inside and still try to get into the trap. The paper seemed to work really well. The only downfall I have noticed is, that once you have a ton of fruit flies in there, how do you kill them and get them out without taking the paper off (the lies one fly away!) I managed to shake up the jar enough to get them all wet and then empty it at the sink where I could rinse everything down with water before they had a chance to dry off and fly away. Another option is to set the jar outside and forget about it (yup, I did that) until they all die, then take the paper off and clean out your jar. I had more than one trap going in the kitchen at a time and switched them out often for a fresh one. 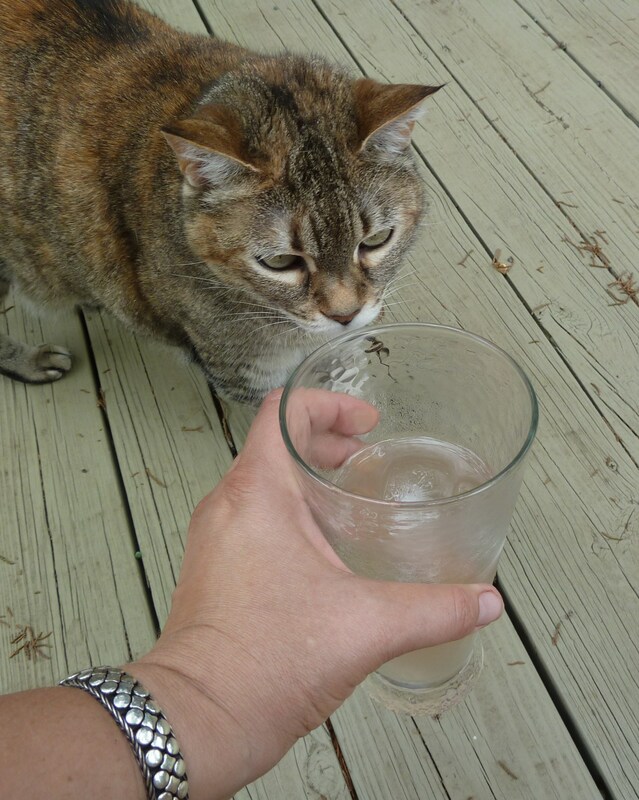 I realized that I needed fresh ginger beer in their to keep attracting them into the trap. Have you made a fruit fly trap that works well for you? Please share you experiences in the comments. When we moved to Texas I was thrilled because we had a big backyard and lot of space to put a garden in. Before I did anything out back I waited to see what was growing back there in the “flower” gardens. The previous owner had said, “oh the back gardens are beautiful with so many blooming things,” so I waited and watched. Hmmmm….. looked like a huge unkempt mess to me, all over the property, and after waiting and watching, that is mostly what it was – a mess. As I slowly made my way through the mess I also started planning the vegetable garden. Lots to do. When it came time to put tomatoes in, I got out my old tomato supports – you know, the galvanized support that is round and bigger on top, then tappers done to 3 or 4 spikes to anchor it in the ground. They had served me well in the past, but after using them here, they just weren’t big enough or heavy-duty enough to support the tomato plants. My neighbor showed me the cages he made. They were made from reinforced concrete mesh. It is really rusty, but it worked. So I picked up some hog rings, borrowed my neighbors bolt cutters and a special pair of pliers (that he modified to secure the hog rings) and I was ready to make my own tomato cages. These cages have worked great for all of my tomato plants, and I even use them for some of the pepper plants like Anaheim and bell peppers that tend to get real tall. The other peppers I plant (banana, cubanelle, jalapeno, Serrano, cayenne get bushy, but so seem to need the support of the cage so I just don’t cage them. If you do a quick search on the internet for “tomato cage images” you will see 1000’s of examples. The cages I make and use are just one example. Originally, I bought a roll of the concrete reinforced mesh and I still have those original cages today. A few years ago I bought a 300′ roll of galvanized wire and have been using that roll as I needed more cages and other things around the yard. 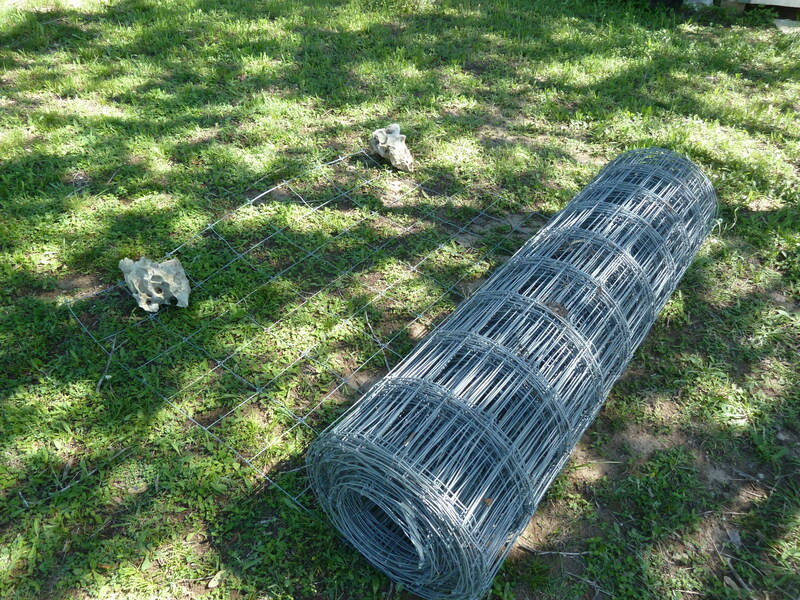 I usually do this kind of stuff on my own, so to keep the unrolled section of fencing from rolling back on top of me and (biting me as it springs back,) I take two rocks (see photo above) and to anchor the ends down as I unroll the fence just enough to make one cage at a time. I count the squares off and stand on the section of fence that makes up the cage. I have found that using bolt cutters cuts the wire so easily for me. 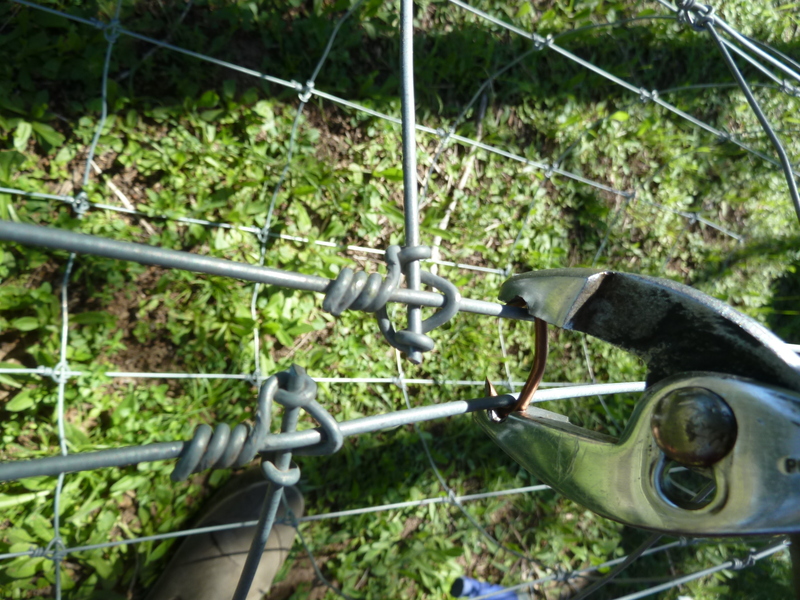 You can use a wire cutters, but since I struggle with tendon issues in my hands the last thing I want to do it aggravate that, so I use the bolt cutters – no problems. Once I have cut my section of fence, I cut off the the exposed, raw ends. 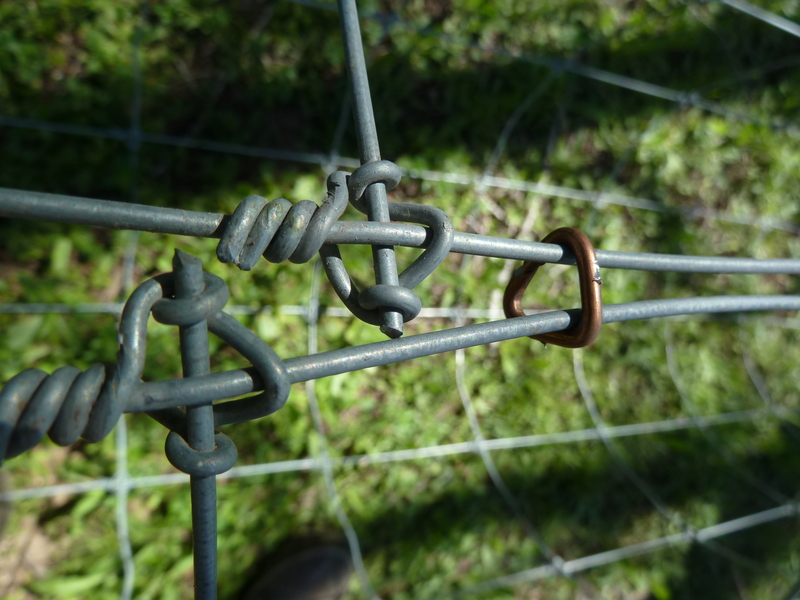 You can use those ends to wrap around and secure your cages with those end, I just don’t want those rough ends – I tend to scratch myself up on them while picking tomatoes. Before I finish my tomato cage, I pick up the raw ends I just cut off. I count them each time to make sure I didn’t miss one. The last thing I want to do is run over one of those with the lawn mower! 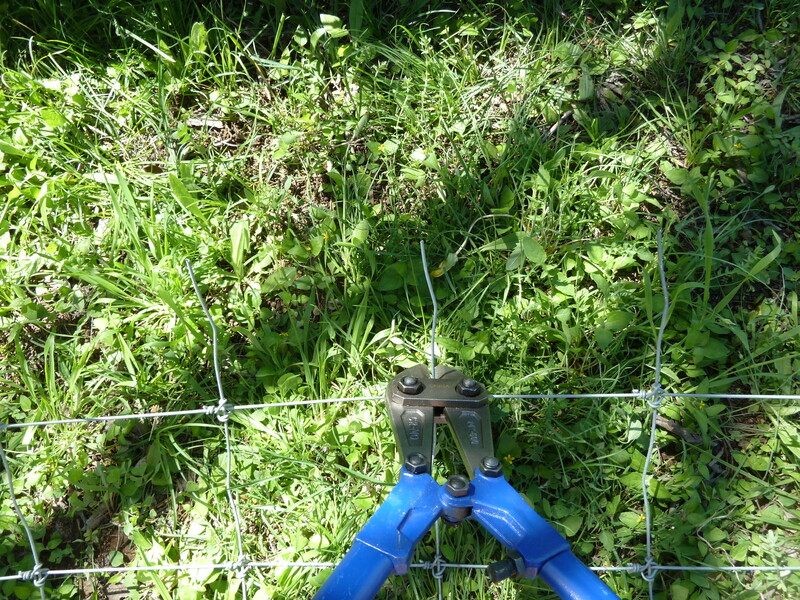 Now, it is time to connect the ends of the wire fencing to make the tomato cage. I use three hog rings per cage. You can use more if you want, that is up to you. I get one hog ring ready in the special pliers. 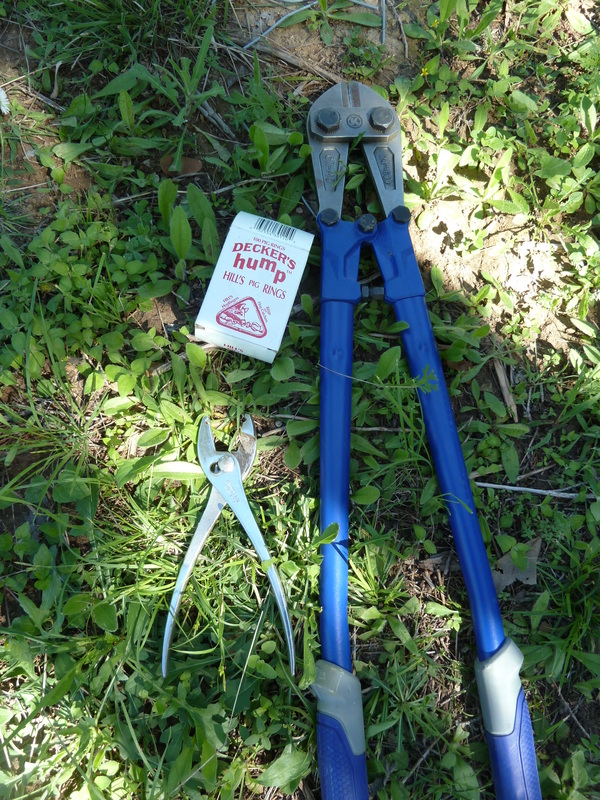 My neighbor cut notches in a normal set of pliers so the hog rings wouldn’t slip out as he was using it. I think you can buy a set of pliers specifically made for this tasks, I am just using the tools that my neighbor has. I start by securing the middle section of the cage first, that way I don’t have one end of the wire gaping and flopping around ready to scratch me up. 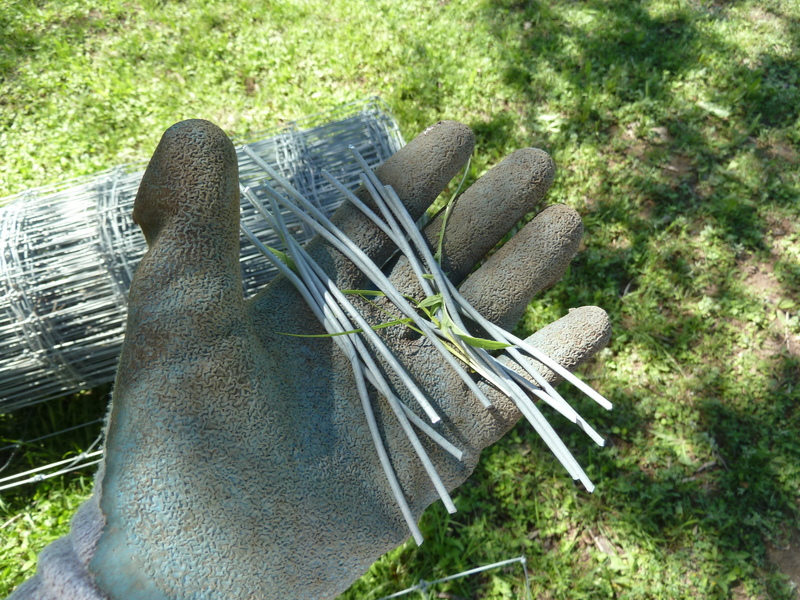 I roll the wire fencing into a tube and hold the two ends together near the center. My other hand is ready with the hog ring. Then is is just a matter of securing the two ends. Your cage may be a bit out of shape. Just roll it and push down on the wire to get it formed into a nice circular tube. These make very study tomato cages and they will last for many many years. My neighbor just started replacing a few of the cages he made using the reinforced concrete mesh that he made 15-20 years ago. This is a post I had started over on my personal blog a few years ago, but it just kept getting pushed further down the posting list until it was out of sight. Alexandra commented on my post last week about getting the recipe…. just the push I needed I guess. I found this recipe back in 2010 over at Living on a Dime and I have been making them ever since then. This is what my husband has for breakfast every day. They make a great snack and they freeze well. I always grab a few to take with me when I head out to run errands for the day. Having them with me keeps me from making a bad decision (fast food drive-thru) when I start to get really hungry. I stack them in a pint canning jars to take in the truck. The base of the recipe is great and then you go off in the direction you want to with your special ingredients. I substitute honey for the granulated sugar in this recipe. I know honey still has calories just like granulated sugar, but I am not focusing on calories here, I am focusing on my ingredients and where they come from along with the benefits of the things I add to them. Also, I think I am getting a healthier granola bar then the ones in the store that are full of additives and preservatives that I am working so hard to stay away from. Add dried fruit, nuts, coconut, etc. The bars will firm up as they cool. Allow the bars to cool completely before cutting. I don’t tend to measure the ingredients when I am making these up, other than there is always a 1 cup measure in each jar of flour that I have and 1/4 cup measuring cup in both my oatmeal and my puffed millet. I have found when using honey in place of the granulated sugar that I need to add more flour to the mixture. 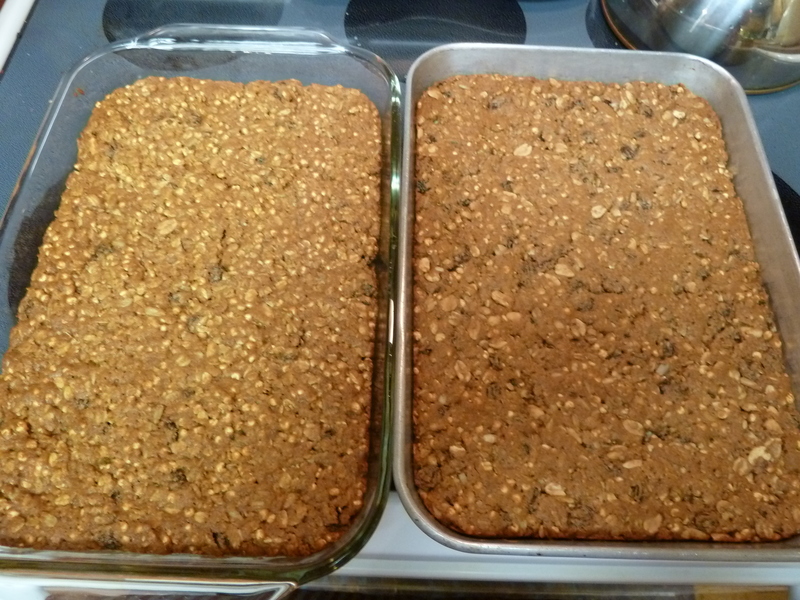 Since I am not measuring, my granola bars can come out either quite chewy gooey or quite firm and crunchy. Another thing to keep in mind when using more honey in these bars, is that if you bake them at 350F like the original recipe calls for, they will brown and burn more quickly and the bars won’t be completely cooked, so I turn down the oven to 300F to bake them slower and a lower heat setting. They still brown up more, but they don’t burn as quickly. I cannot count how many times that I have passed on this recipe and everyone that has made them has been thrilled with the results. I make two batches at a time and always keep them in the freezer. 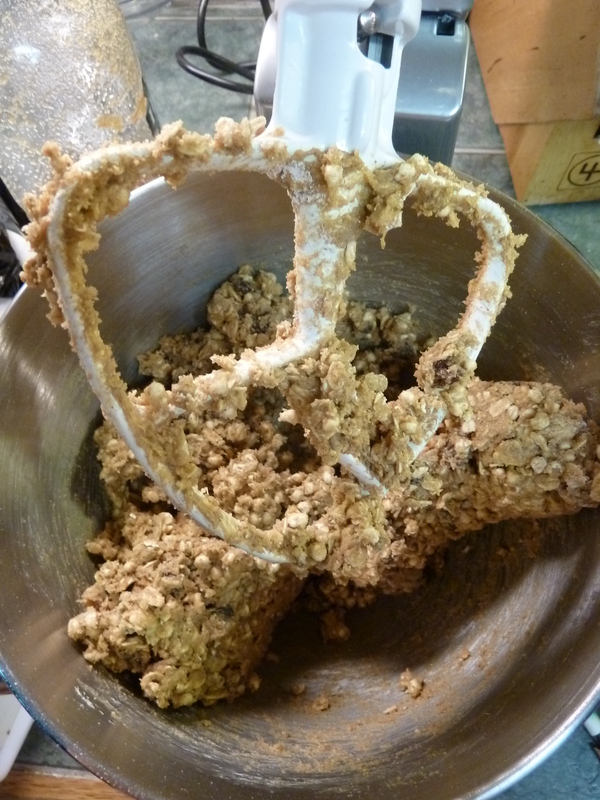 Do you make your own granola or granola bars? Feel free the share your recipe or a link to it in the comments. Over the past few months I have helped a some friends start making up liquid laundry soap. Now that they have seen how easy it is they are asking more questions about additional recipes. One that keeps coming is is Dishwasher Detergent. Use 1 T per load in detergent compartment. Well, that basic didn’t seem to work for me and there are several variables that seem to make this either; sort-of work, work really well, or not work at all. I have been through all of them. The Big variable is the water. It is amazing how much difference there is in water. We all know about soft water and hard water, and then there is everything in between. All those “everything’s” are huge variables, apparently, in making your own dishwasher detergent. In all my trials, what it came down to was the amount of citric acid in my recipe and the amount of homemade detergent that I actually put in my dishwasher each time. Here is the recipe that is working for me. If my silverware and glasses come out cloudy – that usually means I got carried away and added to much detergent mixture. If it happens, I am more careful about measuring it out next time I do the dishes. I use regular white vinegar in the rinse air compartment or a citrus infused vinegar (made by taking the peel (no rind) off any citrus and letting it sit in vinegar for several weeks. Now that I have been making my own dishwasher powder for a few years, there is still one more things I have struggled with; the mixture getting hard in the the jar. Every time I wanted to run the dishwasher I would have to chip away at the jar of dishwasher powder to get some of it out. I am a pretty patient person, so I didn’t get too worked up about having to chip away at it, but the final straw was when I couldn’t get it broken up with a spoon like I normally did and I used a knife. Not only did I chip away at the dishwasher powder, but I took a big chunk of glass out of the bottom of the canning jar it was in. Opps! This patient person reached her limit. Time for a change. My quick fix to this problem was just to keep the ingredients separate. Ya, that means opening four jars to just get the ingredients out, but each ingredient isn’t clumping up anymore. No chipping away at it. It is working great. Now instead of 1T out of a big jar I measure out just shy of 1 teaspoon of each ingredient per load and things are working great. No more clumping. No more chipping away. yes, I have to open four jars, but I still think that I am ahead of the game when it comes to frugal and environmentally safe. 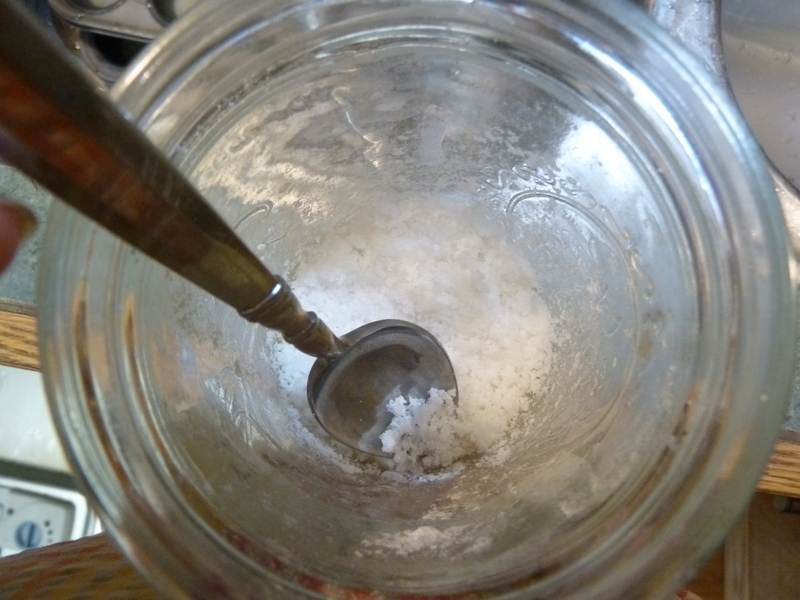 Do you make your own dishwasher detergent? Lately I have been taking an appetizer to several different meetings. In the effort to make things easy on myself I just keep taking the same herbal cheese spread over and over. I don’t have to think about it, just make it and take it. This spread is also great on toast and has been breakfast for me a few times over the past few weeks too. Blend two cheese until smooth. Adjust the amount of sour cream to reach the consistency that you want. In place of the cream cheese you can use the farmer’s cheese that Jen posted about here at NDIN a few years ago or you can use a yogurt cheese. I didn’t find a post here on NDIN about making yogurt cheese so I will post about that in the next few weeks. Using the farmer’s cheese or the yogurt cheese changes the consistency of this herbal cheese spread, but it still works. You can use what ever blend of herbs you like. Play with it. Have fun with it. Do you have a favorite appetizer that you tend to make a lot? With my new scoby in hand I was ready to get started. I better back up a bit… what the heck is a scoby? You may remember from Miranda’s post about vinegar and its mother; it is a symbiotic colony of bacteria and yeast or scoby, and it turns a simple brew of tea and sugar into an amazing beverage. Kombucha is one of those wonders of the world I think. Chalk full of great stuff like beneficial enzymes and probiotics. Amazing things that will help with your entire body. Seriously, it is that good for you! I am not the first at NDIN to write about kombucha. You can read a great post about it called “Kombucha” that was posted back in August of 2008. I encourage you to read that post, it is full of a lot of the details and benefits about kombucha so I won’t repeat it. Even though I had read a lot about it, I still had questions, so I wanted to share with you about the things I didn’t find in the books I read. My friend handed me the smaller jar like you see in the above photo with an odd looking “thing” inside with some liquid. 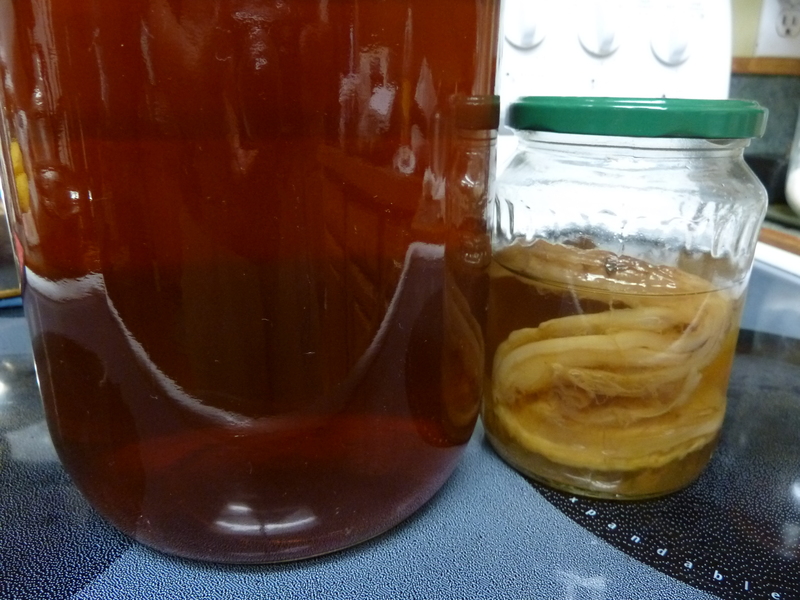 That “thing” is the scoby. The liquid is there to keep the scoby moist and alive, but that liquid is also used to start your new batch of kombucha. I didn’t go home with much more information. All she said was keep the scoby in the refrigerator until you are ready to use it (slows down the growing process.) Brew some strong black tea with sugar, let it sit over night and once it is at room temp you can add your scoby. How much tea? How much sugar? What do I put it in? Bring water to a boil. Remove from heat. Add the sugar and stir to dissolve. Add tea. Let steep until liquid is at room temperature. Remove loose/bag tea and pour liquid into gallon-size jar. Add your 1/2 cup of kombucha that your scoby came in (or from your previous batch), place scoby on top of liquid and cover with a cotton dish towel. 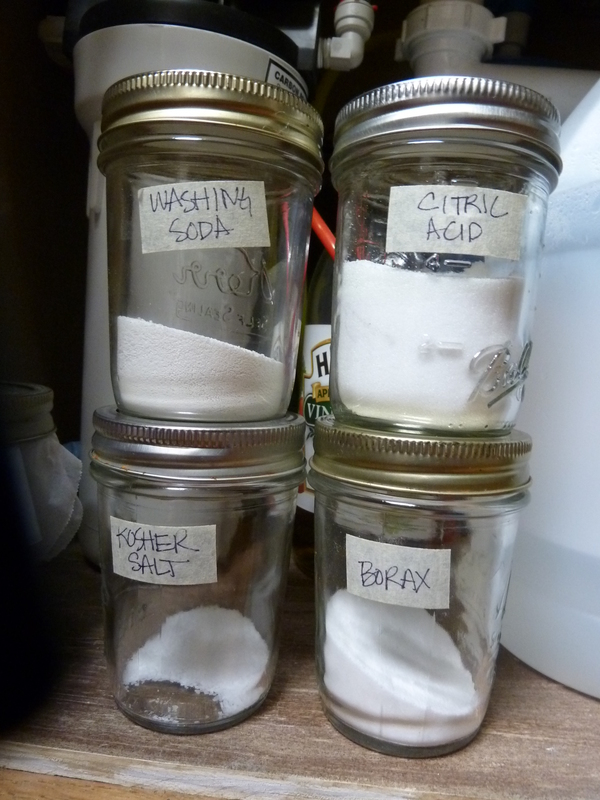 You want your towel to do two things; cover the opening in the jar to keep dust and critters out, yet allow it to breath and also to keep the entire glass jar covered and the contents in the dark. Brewing your batch can take anywhere from 7-10 days. I initially went with 10 days, but after 2 batches I realized that 7 days worked much better because of the amount of heat in our house. I found that brewing it for 10 days the outcome was a very sour, vinegary tasting kombucha, while the 7 day brew was a bit tart and tasted much like a tart apple cider or apple juice and had quite a bit of fizz that had developed. I imagine as the fall temps start creeping in I will need to increase my brew time. So, I set out and brewed my tea liquid and was ready to start the following morning. Some of my loose tea escaped through my tea ball so I strained the liquid as I added it to the jar. Next was to get the scoby out of the smaller jar. I wasn’t prepared for the feel and texture of it. It was much firmer than I expected, and spongy/fleshy (sorry). I was trying to gently get it out of the jar with out damaging it. I thought it was a tender, delicate “thing.” My brain kept telling me “it’s alive” and I as I was nervously laughing, I had to keep saying out loud, over and over, “it’s ok, you can do this” like it was going to suddenly move or wiggle. I finally got it into the larger jar and it looks like a big flat pancake in there (just like Miranda’s Mother), although this one looked like it had been used for a few batches (and that ok) and was sort of frilly around the edges. On day 9 I brewed up another batch of tea/sugar and let it cool overnight. When day 10 came along, I was ready. I had peaked on and off at the kombucha brew as the 10 days went by and I could see the new baby “mother” forming. It was very white and creamy compared to the darker tan on I started with. I started by trying to separate the baby from the original scopy while it was still in the jar. I have since figured out it is easier to get it out, place it in a bowl and do the separating then. I poured the brewed kombucha into bottles and set them in the refrigerator to cool down. I washed my gallon jar and was ready for my second batch. I poured in the tea/sugar mixture and then set out to separate the two scobys. That first time was interesting. The were still quite attached to once another and it took me a few seconds to get them separated. My new baby scoby came off with a hole in it about the size of a quarter. I still used it and placed it in the new liquid helping it to lay on the top and then added some of my newly brewed kombucha. The older mother I placed in a jar along with addition kombucha and placed it in the refrigerator. I needed to make another batch of tea/sugar and then I could use that mother too. I checked on the new baby after a day and noticed it was not floating horizontally on top of the liquid, but it was completely submerged and floating vertically. Vertically! What?! I think that happened because of the hole in it. 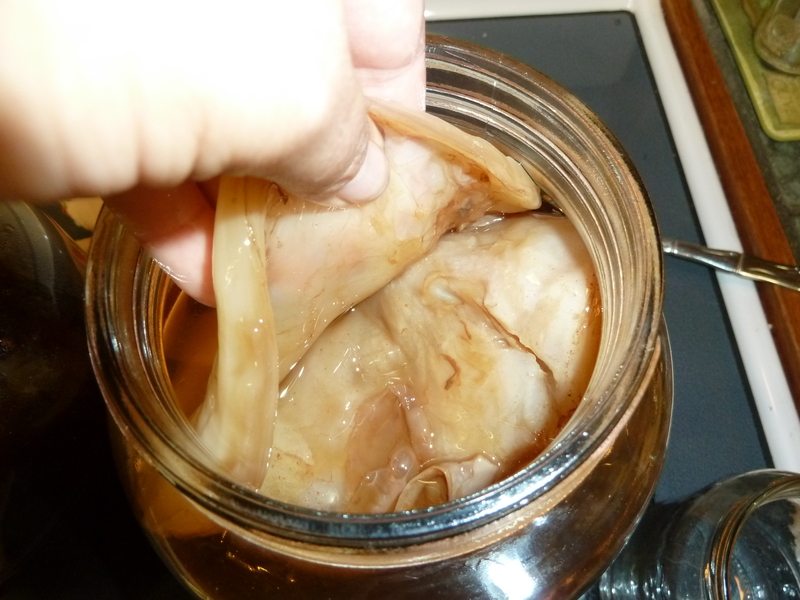 The batch still formed a new scoby horizontally at the top of the liquid. It was so perfect and smooth that is was amazing looking. I also now stagger my batches or I run out of empty bottles to use and run out of room in our refrigerator. Brewing your own kombucha is easy, very affordable and very healthy. Cost: One 16 oz bottle of kombucha in the store is anywhere from $4-5. I can brew 4-16 oz bottles for the price of 4 tea bags and 1 cup of sugar. Scoby: You can buy a scoby online or get one from a friend. I was thrilled to find a scoby from a friend. Now I have a several scoby’s in my refrigerator just waiting to go to new homes. I will keep a few in there as back up, but the rest go into the compost pile. 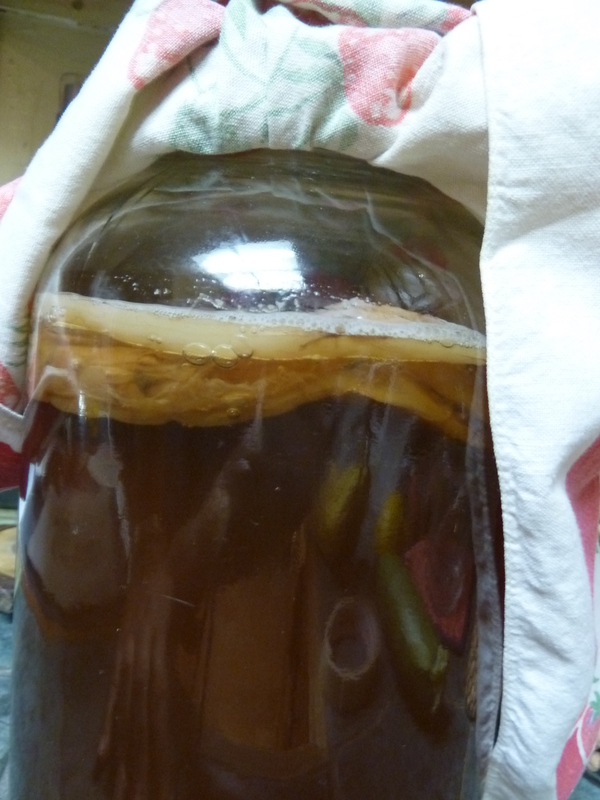 Vacation: after you brew a batch, just place your scoby in a glass bowl w/lid or jar and cover it with kombucha. Store it in your refrigerator. It will be waiting for you when you get home. How long does a scoby it last? : The scoby can be used for many, many batches. If you start to notice any black spots or the entire scoby turned black, it is time to discard it because it has become contaminated. 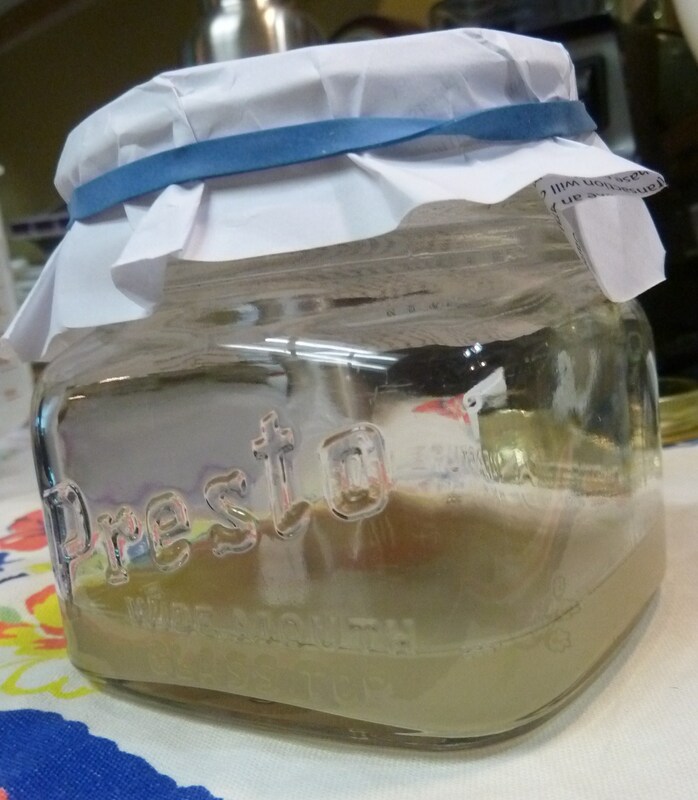 Your newly developed scoby is so white and creamy in color, but it be more brown after your first batch with it, that is normal. If you batch isn’t souring properly, it is also time to toss that scoby and start with a new one. How long does the kombucha last once you have bottled it? : I haven’t tested this yet. We drink the kombucha withing 3-4 days. If you get a scoby from a friend or order one to get started, I hope you have fun with it. Even though you can buy kombucha in most health food stores (in the refrigerated section) you will find that making it yourself, at home, is very inexpensive and easy to do. I think making ginger beer will take a back seat to kombucha in our household. 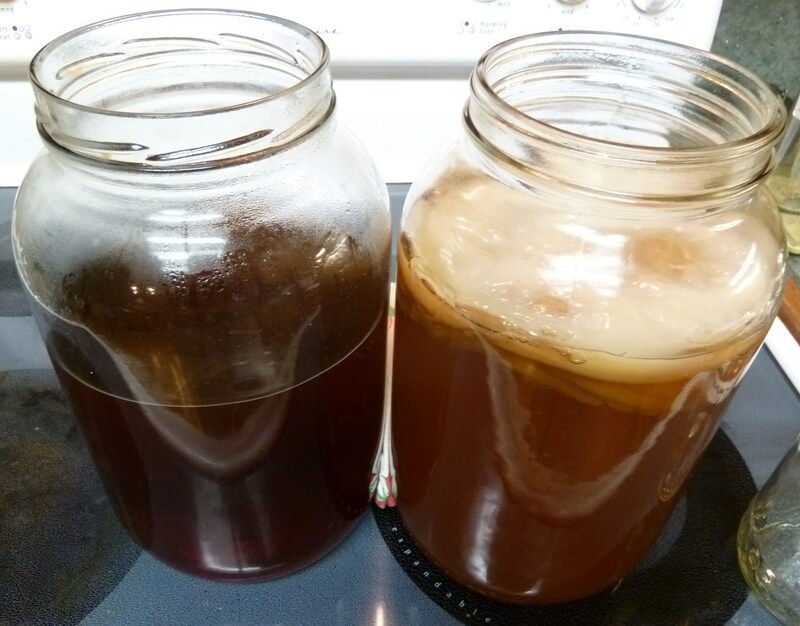 They are both super easy to make at home, but I think, once you have a scoby, kombucha is so much easier and I think the benefits far out weigh those in ginger beer. One book I read cautioned about allergies noting that some people may have a reaction to kombucha. With anything new (and fermented), it is always best to go slow. Try a bit and see how you feel and how your body reacts before you jump in head first. I remember an experience when I was younger that involved homemade sauerkraut. Eating too much right away lead me to spending a bit of time in the bathroom. So…. start with a little and work y our way up to more. Your body will appreciate you thoughtfulness. Have you made kombucha before? Do you have anything you’s like to share about your experiences with it? Growing up in Minnesota and Wisconsin, I am no stranger to rhubarb. I have wonderful memories from both my mom and my Gram of cutting stalks from the plants and going inside to dip the end in sugar and crunch into it. Here in South Texas, I am still working at growing rhubarb of my own. Three years ago I brought transplants from my mom’s garden in Minnesota. They came up, then quickly lost energy. Our summers are just to hot, but since then I have learned that I can grow it as an annual here. So, last fall I planted four plants that I happened to stumble across at a locally owned nursery. We had a very mild winter, but I was sure to cover them on the nights we had frost. Long story short… they didn’t make it. I did everything I could, but the ants built nests in the heart of each plant and by the time I noticed it, they were doomed. Mom to the rescue. When my mom got back to Minnesota this spring she wanted to try to mail some cut rhubarb to me. She cut fresh rhubarb stalks on Monday, packed it into a UPSP Priority box and shipped it off to me. It arrived on Thursday; safe and sound. By Saturday afternoon I was sipping on a cool Rhubarb Fizz. Many of you are in areas that are still enjoying the bounty from your rhubarb plants. Making Rhubarb Fizz is one more recipe to add to you recipe box and a great refreshing way to enjoy rhubarb! I did not create this recipe, I found over at Savor-the-Rhubarb. Head over there for other great rhubarb recipes and a wealth of other great “rhubarb” information and uses. Combine all ingredients and let stand in a pail for at least 2 full days. Strain out fruit and residue and bottle. We keep our house pretty warm in the summer (around 80F) and even with the little bit of vinegar in the above receipt, it is not enough to keep mold from starting to form on the top of the mixture. I tend to keep an eye on it and strain it after 1 ½ days to be on the safe side. This is meant to be consumed reasonably soon, as the mixture could become quite pressurized over too much time. 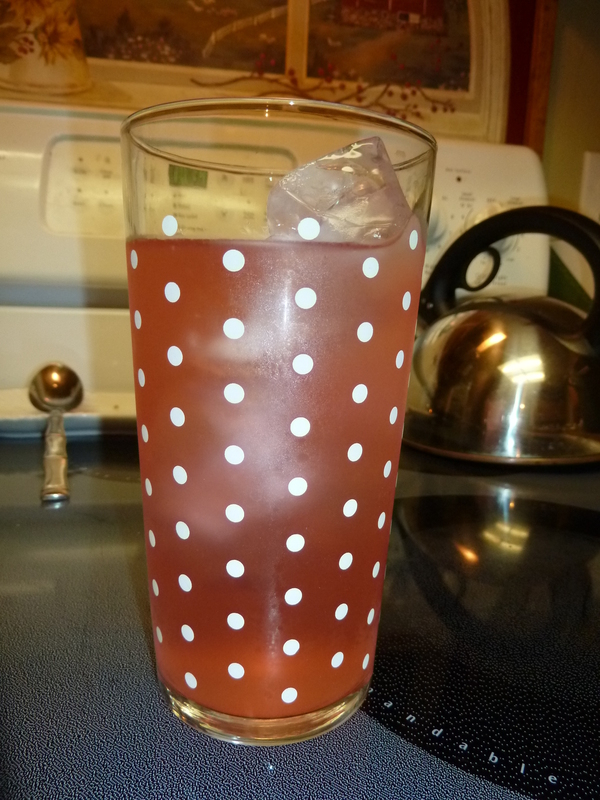 The color of our Rhubarb Fizz will vary depending on the color that comes out of your rhubarb. I have made this where it turns out a deep pink color and other times it is on the pale side. 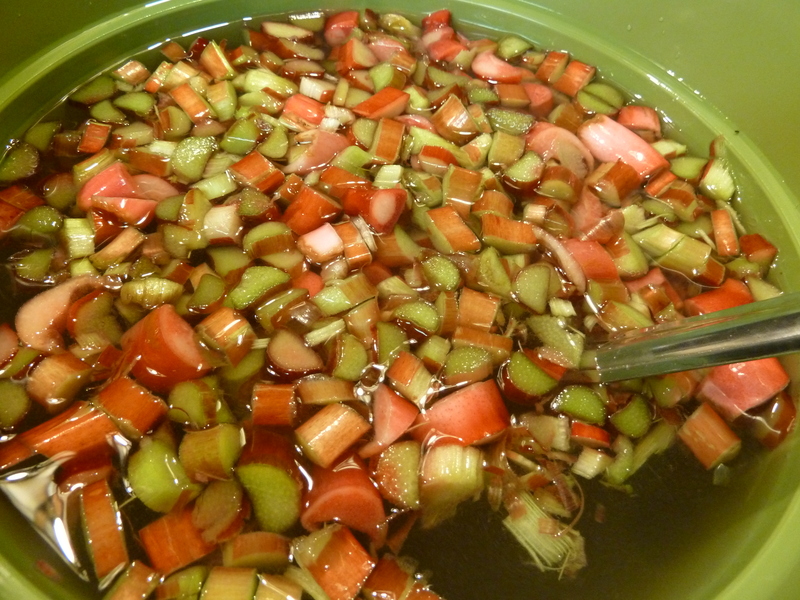 The darker shade seems to have a deeper flavor and a bit more tartness to it while the batch I made with my mom’s spring rhubarb was very light in color and had a very light flavor. Both are very good. The first time I made this I saved the rhubarb from the mixture and used it to bake a cake. Aaaahhhh, that didn’t go so well. The lemon in the mixture really didn’t help the flavor of the cake at all. My thoughts were that it was coming out of a mixture that was so so good, wouldn’t the left over rhubarb be good in a cake. Nope! Lesson learned. It was more useful out in the compost. 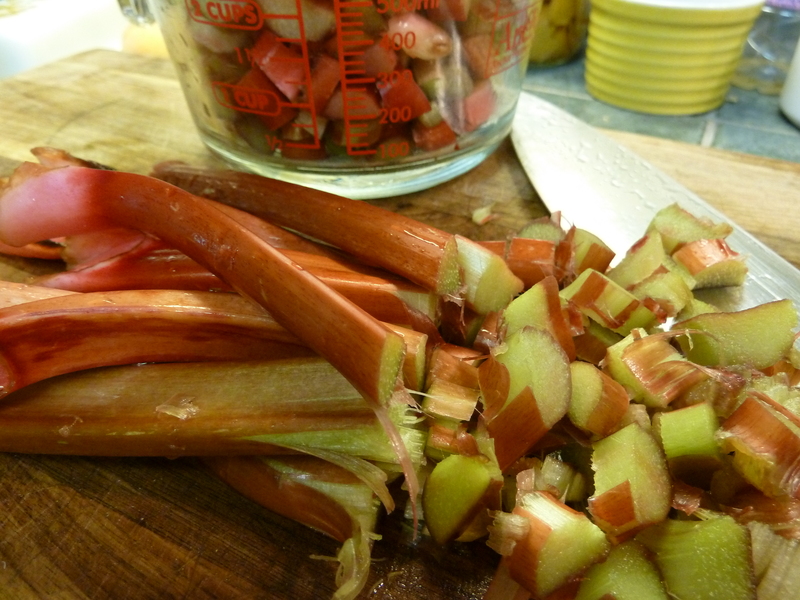 If you have a hard time keeping up with the ever-growing rhubarb plants, be sure to chop and put some in the freezer for using later. When ever I take a trip to visit my mom I come home with as much rhubarb as I can fit in my suitcase so I can stash it in my freezer (in 4 cup measurements) and make more rhubarb fizz. If you have access to any rhubarb at all you should really give this recipe a try and let me know what you think. I have had a lot of fun chatting about the different refreshing summer drinks that I make. If you missed them, you can read about making your own Ginger Mojitos and Ginger Beer.